Are you game? Last week I attended my first Winnipeg Jets hockey game. It is a challenge to get tickets as the 15,000 seats are always sold and the season tickets sold out in a couple of minutes for the first 3 or 4 years. 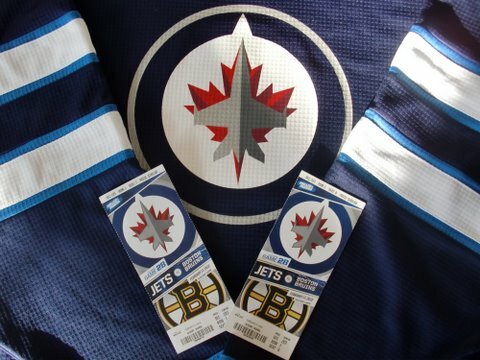 Thanks to my neighbour Andy, who knew someone, my wife and I finally got to a game with the Winnipeg Jets playing the Boston Bruins. We (notice the sense of identification) beat the Bruins, the Stanley Cup champions, 4 to 2. But the real story for this employee engagement site is the lessons we can learn from the Jets for employee engagement. To have a positive impact on engagement you don’t need to read another business or leadership book, you may just need to look at thing right in front of you and look for the lessons that apply to employee engagement. Engagement is the strength of connection to work, results, the organizations, and each other. Lesson 1: An engaging story. Winnipeg lost their NHL franchise to Phoenix about 15 years ago. This season we got an NHL team back in Winnipeg. This has become an engaging and classic story of pride, loss, challenge, and victory through return of the team to Winnipeg. This is not quite the Odyssey but it certainly has elements of a very powerful story that fully engages the city of Winnipeg. Even my massage therapist wears a Jets jersey on game day because her young son will not let her leave the house without putting it on. Our logo, of the fighter jet, hints of the battle to win a team back. The feverish passion of Jets fans may be just as much about the narrative story as the players on the ice. What story does your organization tell that engages employees? Are your employees part of the story? Lesson 2: An engaged brand. The Winnipeg Jets have a wonderful logo and a strong brand. In today’s age though your brand is less what you say it is and more what your customers and employees say it is. The company responsible for bringing the Jets to Winnipeg is True North Sports & Entertainment Ltd. It must thrill their ears before every game during the singing of O Canada to hear 15,000 fans shout out the words TRUE NORTH embedded in the lyrics of O Canada. What would it take for your employees and customers to” shout out” your brand? Lesson 3: Results. There is general excitement about the team but don’t ever kid yourself, results matter. Results matter for hockey teams and organizations. It made a difference that the final score was 4 to 2 for us (see the identification again, as I wasn’t actually on the ice, I was sitting in the stands). Results must be something not only important to CEO’s and shareholders, results must matter to everyone. Do your employees live or die with your results? Lesson 4: Performance. Results matter as does performance. You can’t always control the results but you can give your best to your performance. Fans got very excited by some key performances especially a save by Pavelec, the goalie, in the third period. A strong performance engages not only the performer but people around the performer. Are your employees seeing excellent performance and are those exceptional performances fully recognized? Do employees feed off of the strong performance of others? Lesson 5: Progress and Set backs. Teresa Amabile and Steven Kramer in The Progress Principle wrote about how important progress is for engagement and that setbacks are very detrimental to engagement. Set backs are two times as powerful as progress so it is vital to prevent and guard against set backs. The Jets are built around solid goalies and strong defense. Is your organization designed to maintain engagement by being built to prevent setbacks that would diminish both progress and engagement? Lesson 6: Ask and Trigger. The scoreboard at times would ask fans to make noise, as fans would start being loud the scoreboard would then flash: “LOUDER.” We sometimes overlook the simple approach of asking for what we want. Winnipeg is already one of the loudest places in the NHL. Are you asking and letting employees know that you want more engagement? If you have a very engaged group do you ensure triggers are in place to sustain that engagement? Lesson 7: Keeping score. The scoreboard, at all sporting events, is a key element of the game. We knew how many shots each team had taken. We knew how much time was left in the game or in penalties. We knew the score. This is a fine example of a key principle of games. 2011 was a strong year for looking at the gamification of work. Do your employees have a scoreboard or dashboard where they can keep score? Are you utilizing the principles of gamification to enhance engagement? Lesson 8: Offer feedback. Aligned with keeping score is the process of feedback. One area that has experienced a tremendous boost because of feedback is the 50/50 draw. When the Jets were here 15 years ago the 50/50 was often not that large by today’s standards. Technology now makes it possible to watch the pot grow every second and this has provided a huge increase in sales because of the power of feedback to trigger behavior. Are your employees getting frequent and timely feedback to encourage more engagement? Lesson 9: The wave. Yes we can be prompted to make noise or buy 50/50 tickets but it is still powerful to see fans work out their own game within a game. The wave has been circling around stadiums for years but it is intriguing to watch as people work at getting others out of their seats, with their hands waved in the air, while creating a sense of movement around the arena. There were a number of failed attempts yet persistence on the part of the initiators eventually got the wave circling around the arena. Do you set up the conditions so the community in your workplace can start and create their own waves of engagement? Are the social media tools in place so people can connect with each others?